I love mixed salads and you’ll see a lot of salads on my blog – many with wonderful dressings and an array of gorgeous ingredients. This salad is a simple side salad, and every bit as scrumptious. 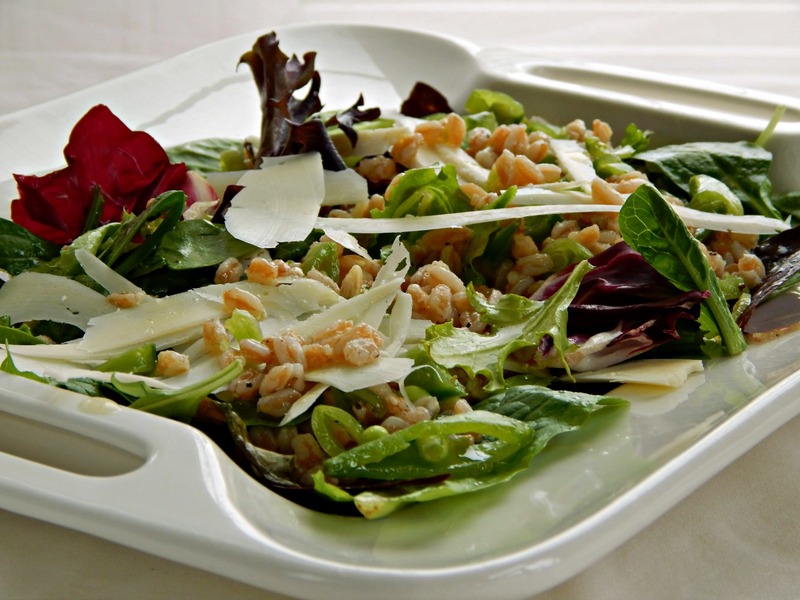 Spring lettuces, barley (or another grain of your choice) a few herbs, and a little Parmesan to dress it up. The dressing, too, is simple: a blend of white balsamic and olive oil, a touch of lemon and shake or two of black pepper. I generally just drizzle the dressing ingredients over the top, give it a quick toss and add a whisper of Parmesan or whatever cheese I happen to have on hand. When I make a dish that uses a grain, I just double or triple and put some away in small portions, labeled, in a Ziploc and freeze. A few seconds in the microwave until nearly thawed and they’re ready to toss into a salad or side at a moment’s notice. If your grocer has beautiful greens that you can pick out and mix and match, you’ll generally pay a lot less than if you buy a bag of Spring Mix. While those bags are handy, they’re often 4 to 10 times more than the bulk lettuces. Add salad ingredients (lettuces, grain, parsley and green onion) to a bowl or platter. Drizzle with the olive oil, lemon juice and balsamic. Sprinkle with salt and pepper and toss. Shave Parmesan or your choice of cheese over the top and serve. I don’t even really measure the dressing ingredients, just eyeball them. Just remember it’s a dressing not a drowning. You know I’ll be bringing this to our Throwback Thursday #38 Link Party, hosted by Quinn of Dad What’s for Dinner, Meaghan of 4 Sons are Us, Alli of Tornadough, Carlee from Cooking with Carlee and Moi! That’s right – me! Click over to our latest Throwback Thursday post for links to their blogs and social media, rules and more info or just click on the blue leapfrog, below, to view all the Throwback Thursday Posts or enter your own! I’ll also be bring this to Angie’s Fiesta Friday, hosted this week by Ahila @ A Taste of Sri Lankan Cuisine and Diann @ Of Goats and Greens. This entry was posted in Click here for Fabulous Food Posts and tagged Cheese, Easy Recipe, Frugal Hausfrau, Green Onion, Lettuce, parmesan, Salad, Salad Dressings, Vinegar, Whole Grain. Bookmark the permalink. Delish! I’m with you I don’t like buying lettuce in bags. They don’t keep as long either. And sometimes they smell baaaaaaad when you open them! The first word that comes to mind when I look at this recipe: REFRESHING! It is simple, yet (or even because), it hits the spot. Glad to see this one over at the Fiesta!! Thanks, and it helps so much. I really like to add them to veggie/bean mixes, like a home-made version of those fancy frozen side dishes.